Horn antennas occur in a variety of shapes and sizes, ranging in application from electromagnetic sensing, RF heating, biomedicine, reflector feeds, and as reference source for antenna testing. In some situations, it is required that the horn antenna operate over a wide frequency band, such as in UWB applications. 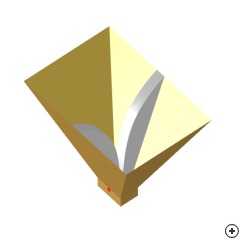 Corrugated horns are able to operate up to bandwidths of about 2.4:1, by special attention to the input match. Other approaches are needed when bandwidths as wide as several octaves are required, taking note that input match and radiation pattern behavior are parameters which usually define UWB operation. This horn is typically used for EMC and calibration measurements because of its large bandwidth.